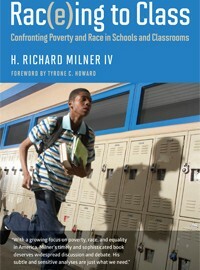 I have had the pleasure of reading Milner’s latest book on education, Rac(e)ing to Class, Confronting poverty and race in schools and classrooms. It is not an intimidating looking book but it is packed with content. I first heard of the book on NPR and was able to get a copy from our local University library. The best part of how Milner writes is that he is honest. He doesn’t have all of the answers but he had done his research and presents what he thinks is a pretty good answer. As a young teacher it is refreshing to hear that it is not always about the teacher, but that leadership needs to lead on issues of poverty and race. Now, working at a university and not as a teacher it is with pleasure that I try to assist in those transformational shifts. These discussions can be uncomfortable but the more you talk about it, I find allows for a deeper unpacking of the complexity. Just a few pages after the quote above Milner quotes W.G. Secada on what is meant by equity. “The essence of equity lies in our ability to acknowledge that even though our actions are in accord with a set of rules, the results of those actions may still be unjust. Equity goes beyond following the rules…equity gauges the results of actions directly against the standards of justice.” p. 34 (I added the emphasis). I love how that chosen quote frames the book. We all try our best to do the right thing, throughout those efforts, check back in to see how it stacks up against the standards of justice. A thread of optimism weaves through the writing, everything is a challenge, but a challenge with opportunity. Milner writes for the first seventy or so pages about the systemic deficiencies of schools, districts, and instructional methods. I believe he does so accurately while recognizing the standards based testing drum decrescendo into a soft bass line. There are nice nuggets of insight in this first half, the second part is even better. The second part comprises the case studies and a dissection of teacher education programs. The NPR story I link to above does a good job of hooking the listener on these case studies. I like the way Milner talks the reader through the situation and delivers an improved lesson for students and the school community in each one. It is masterful. Go borrow or buy the book. You won’t be disappointed. Purchase directly from Harvard Education Press. Milner IV, Richard. H. Rac(e)ing to Class: Confronting Poverty and Race in Schools and Classrooms. Cambridge, MA: Harvard Education Press.